On a college campus in Williamsport, PA, a major industry has found a foothold, while students have found a path to nearly 100 percent employment. The Plastics Innovation & Resource Center (PIRC) at Pennsylvania College of Technology (PCT) focuses on innovation, research and development, and job training. We asked Shannon Munro, PCT’s vice president for Workforce Development & Continuing Education, to tell us more. Keystone Edge: What was the impetus for founding the Center? How did it come to be located on your campus? Munro: [Plastics and polymer engineering faculty] Tim Weston started the program that was the predecessor to the PIRC in 1992. With seed money from Ben Franklin Technology Partners, he was able to get the program off the ground. The Center was founded because of an identified need to provide plastics-focused R&D assistance and training to companies. 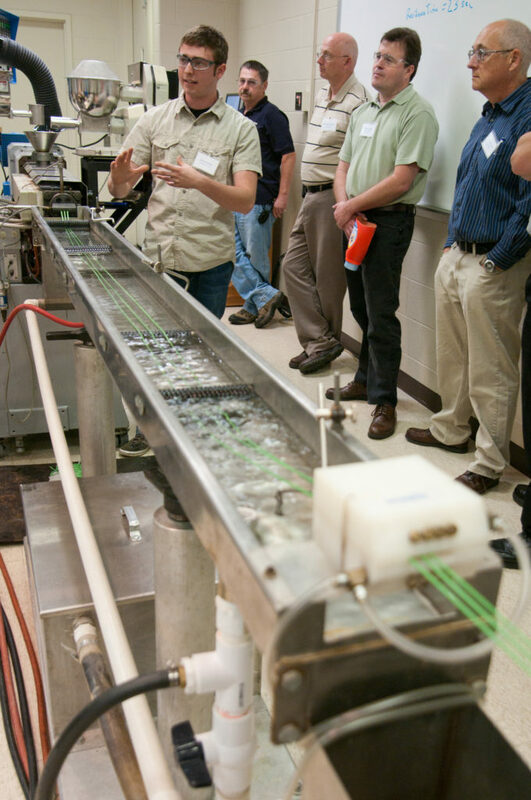 Over the years, the Center has grown to supply hands-on customized training at company locations and in our state-of-the-art facilities on campus. We also offer annual workshops attended by employees from companies all over the U.S. and the world. Are there other such centers around the country? I am not aware of other centers that mimic ours. If you instead asked, “What makes the PIRC stand out?,” this is the answer: The PIRC incorporates a hands-on approach to training in all areas of plastics processing including thermoforming, injection, extrusion, blow molding and rotational molding. While we have equipment in-house available for use during seminars and customized training, we also travel to companies that prefer training delivered at their location. Rather than stopping production, companies often seek the assistance of the PIRC to help solve problems that could be related to materials, molds, testing or other areas of operation. The PIRC offers Global Standards for Plastics Certification (GSPC)…an innovative approach [that] is a significant advancement in plastics skill development, providing companies with a fully customizable platform built upon established standards. Employees benefit from learning company-specific processes, procedures and protocols, along with process-specific technical knowledge. Tell us about your academic offerings. PCT offers an Associate of Applied Science and a Bachelor of Science in Plastics and Polymer Technology. Students in those degree programs often work for the PIRC on company projects to gain real-world experience in the industry. Graduates from our plastics programs secure employment in the industry, with nearly a 100 percent placement rate. PCT welcomes plastics companies to campus to tour our facilities and hire our students. Unfortunately, not enough students choose to pursue a career path in manufacturing, plastics included. This imbalance results in unfilled positions. Companies recruiting students have far more openings than there are available graduates to fill them. How important is the plastics industry to Pennsylvania? Plastics product manufacturing is crucial to the Pennsylvania economy. In 2016, there were more than 32,000 people working at more than 550 companies in PA and the state ranks seventh nationally in industry employment. Plastics industry shipments in Pennsylvania total over $22 billion annually. Nationally, Pennsylvania is ranked fourth in plastics industry shipments. Opportunities related to the Marcellus and Utica shale plays are significant in plastics production, with Pennsylvania holding a considerable locational advantage. According to a recent IHS Markit report, over two-thirds of North American polyethylene and polypropylene demand falls within a 700-mile radius of southwestern PA. The under-construction Shell Pennsylvania Chemicals ethane cracker, a $6 billion chemical plant in Beaver County, is a first step in realizing this potential. Manufacturers will benefit from a shorter supply chain and the prospects of lower raw material cost. Can you elaborate on some of the R&D underway at the Center? Because we regularly sign non-disclosure agreements with companies, we can only speak in general terms. We are working with a globally known resin supplier on new formulations and additive packages to improve mechanical properties and fire resistance. The PIRC is also working with a PA-based plastics manufacturer to develop processing parameters for a new product. In this instance, our equipment has the capability to control tight tolerances that are required for material testing.